Wait a second, what’s this about a Bear? I thought the Williams College mascot was the Purple Cow. 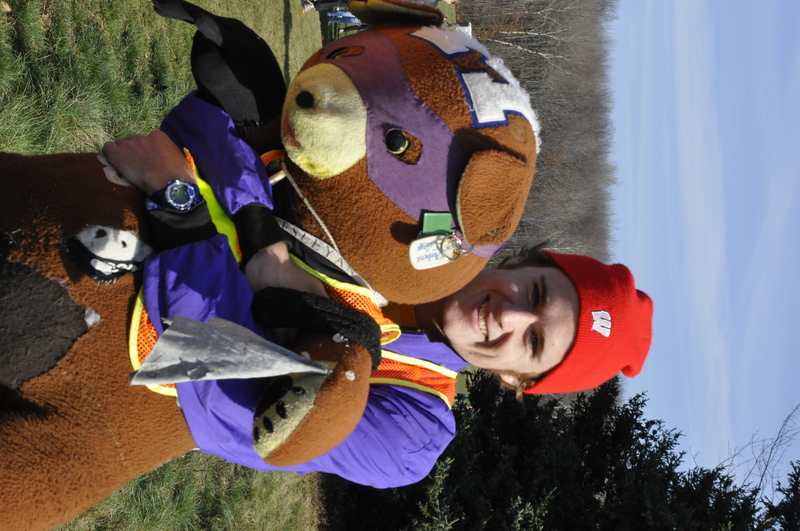 So why does the Men’s Cross-Country teams throw a stuffed bear into the sky before every race? The Bear has come to be a good luck symbol for the teams as the spirit of The Bear propels them towards victory. In 1978, a Williams first-year won a raffle at a local road race. 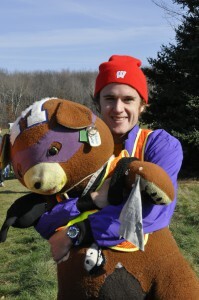 While pawing through the possible prizes, the first-year was “encouraged” by his teammates to avoid the gift certificates and take the huge stuffed teddy-bear instead. 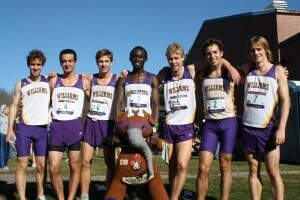 The Bear, as it was creatively named, immediately became a good luck symbol for the team as they upset MIT at the very next meet. MIT devised a plan to get even with the Williams harriers the next time they met. They “barely” snuck the bear away from an unsuspecting Coach Farwell, and it took an exchange of pun-filled letters to get the bear returned at the next meeting of the teams. The Techies used the opportunity to put their own mark upon the good luck mascot by sewing a varsity “T” upon his bare chest. Precedent was set—teams could steal the Williams bear, but they should return him soon after, leaving upon him some new fashion statement. Since then, many teams, including Amherst, Wesleyan, MIT, Colby, Bowdoin, and even the Williams women’s team, have tried to slow the Williams harriers by ‘knapping the bear. Such attempts have generally been major undertakings, as have successive bear rescues, though some teams have recently resorted to more forceful means to obtain the bear. “Advanced Bearknapping 401” has included such lessons as camouflage, escape car drivers, bribes, and other devious methods. During periods of bear-withdrawal, the Williams harriers have been known to wear black armbands, plant beartrap signs on courses, and even toss “surrogate bears,” though it has not stopped them from winning a National Championship while bear-less. Now in his 30th season, The Bear is in excellent health and continues to be an integral part of the team culture. He is anxiously awaiting his B.A. degree from Williams in the spring of 2012.